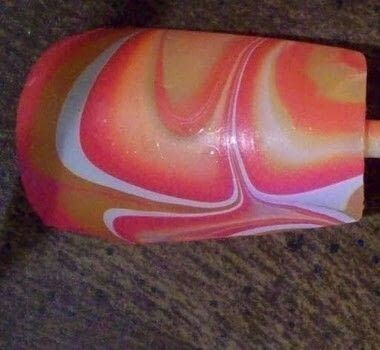 So I've finally got my tutorial done for the marbled nails! So the first picture is of 4 nails that I did before I decided to to the tutorial. I'm really proud of the Yellow and Black one I did, and the Green and Black one turned out great. The Pink, Black and white one has a few smudges, and the Green, Black and Silver one came out way dark. Now this next picture is the nail that I did during the tutorial. I'm super happy on how this one came out! I used Yellow, Hot Pink, and White. This one has to be my favorite of the bunch. can you do it on a real nail? i didn't watch the first time the movie, but i'm impressed of the greate tute you have made, so i thought i must tell you this too. Yep! I've done it both ways. Take some scotch tape and tape off your finger so its just your nail showing. Then dip away! I was just thinking f posting a how to on these!